Replacement teeth supported by dental implants function so well and last so long because, like natural teeth, they are securely anchored in the jawbone for maximum support. Why are implant supported teeth and dentures considered so much close to the natural teeth? Because just like natural healthy teeth the implants are firmly fixed into the jaw bone itself. Unfortunately, quite often the disease which caused tooth loss will also have damaged the bone around it. In these cases, bone quality and density gets compromised and may not have sufficient strength to hold an implant firmly. Furthermore, once a tooth is lost, bone resorption starts immediately around the vacant tooth socket, which further weakens the ability of the jaw to hold an implant. Bone quality also gets degraded due tocertain chronic diseases like diabetes, arthritis etc. But that certainly does not mean people with deficient or poor quality bone structure cannot have implants. You can still get a dental implant, but you may need a bone graft to restore the quality and quantity of the jaw bone prior to implant placement. 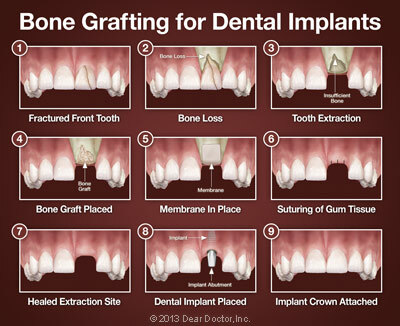 How Bone Grafting is Done? Bone grafting is a routine dentistry procedure that is frequently carried out at a dental office. A small incision is made in the gum flesh to expose the bone that is to be augmented, and graft material is added to it. The graft material acts as a scaffold around which your body develops new bone cells which merge completely with the original bone. Do you recall a plant graft? The grafted material is slowly dissolved away by your body and completely replaced by its own new bone cells. That is just like natural, new bone. The graft material can be obtained from various sources depending on the circumstances. Most often, it will come from another site on the body of the recipient himself. It is also possible to graft material from external sources, e.g., other humans, animals, or even artificial material. In all such cases, the material must be pre-processed to make it sterile so that the recipient body does not bio-reject it. Autograft: This is the usual type of graft employed for dental implants. The graft material comes from the body of the patient himself or herself (auto=self). Hence, it is safe for grafting without processing with no chance of bio-rejection or disease. However, this means two incisions will have to be made-one at the donor site, and the other, at the recipient site. Allograft: This refers to graft made with material from another human or an animal bone. (Allo=other). Such material is available in tissue banks. The material is fromlaboratory-processed bone from a deceasedhuman donor. Xenograft: This bone grafting material comes from a dead animal — usually a cow. Again it is pre-processed to make it sterile. Alloplast: Synthetic (man-made) materials are used in this type of graft. What to Expect After a Bone Graft? Bone grafting is now a routine procedure that is normally carried out under the effect of local anesthesia. In some cases, intravenous or oral sedation may also be required.You may experience some soreness in the area after the surgery which will go away in a few days. Over the counter pain killers and anti-inflammatory medicines will normally suffice, and you will soon feel normal. However, your body may take as many as seven months to complete the graft integration process, so that a strong bone is now available to support the implant. Please feel free to call or visit us at Barnaby Square Dental if you have any questions regarding bone grafting for dental implants.